On August 13, prestigious scholars in philosophy from all over the world gathered in Beijing to attend the 24th World Congress of Philosophy (WCP). The WCP is reputed as the Olympics of philosophy with a history of 118 years. This is the first time that the world’s largest academic philosophy conference has been held in China. The WCP was founded in 1900, and the first event was held in Paris, France. Conferences every five years invited the most important philosophers to attend. WCP has always discussed the major topics, trends and methods in philosophy of the period, embodied the cultural value of philosophy and underscored the unique value of philosophy in advancing social progress. 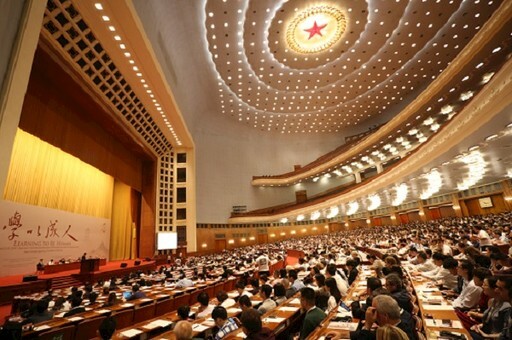 In the Great Hall of the People, Chen Baosheng, minister of education; Lin Keqing, Party committee secretary of the Beijing Municipal Education Commission; Professor Dermot Moran, president of the International Federation of Philosophical Societies (Fédération Internationale des Sociétés de Philosophi, FISP); Professor Luca M. Scarantino, secretary general of FISP; Hao Ping, Party committee secretary of Peking University (PKU); and Lin Jianhua, president of PKU attended the opening ceremony. Also present at the ceremony were representatives of the Organizing Committee and Academic Committee of the 24th WCP, domestic and foreign distinguished scholars in philosophy and the humanities, and over a thousand philosophers and lovers of philosophy. The conference was co-sponsored by FISP and PKU. The duration was one week from Aug 13 to 20. Over 1000 academic activities took place including a general assembly, symposiums, endowed lectures, plenary sessions, roundtable meetings and student sessions. More than 5000 papers have been submitted, covering philosophical studies along with humanities and social issues research centering on philosophy. In terms of the numbers of participants, contributed papers and sessions, this conference is the largest ever event of the WCP in over 100 years. This is the first time that the WCP has adopted traditional Chinese philosophy as the foundation and framework for academic discussion, choosing core topics at the center of the Chinese spiritual order—Self, Community, Nature, Spirituality, and Traditions—under the theme of “Learning To Be Human.” All this has embodied the importance the international philosophical community attaches to Chinese philosophy and its cultural value, a milestone showing China’s growing influence in humanities research globally. In the arrangement of all sessions of the conference, Chinese traditional thinking and its modern features were highlighted; for example, the Wang Yangming Lecture focused on Chinese traditional philosophy. Also, Chinese scholars introduced their philosophical traditions into the discussion covering a wide range of fields and topics, thereby contributing Chinese philosophical resources to the global contemporary discussion in philosophy. Chen said in his speech at the opening ceremony that traditional Chinese thought such as “harmony in diversity,” “helping others when you succeed” and “letting things take their natural courses without interference” (wu wei) will open up broader space for the world’s philosophical development. This conference will, he said, promote mutual understanding between China and the world, and facilitate the development of Chinese philosophy and social sciences studies.